Luckyfinds: ANEW 360 White Day Cream up for Grabs! 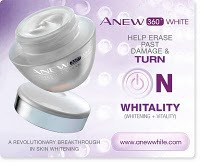 ANEW 360 White Day Cream up for Grabs! Get a chance to win a bottle of ANEW at Mel And Ria Romero by commenting on "How you take care of your skin?" I drinks lots of water and bathe daily to achieve young and fresh looking skin. I use lotion to rebuild sun damaged skin and apply sunblock whenever I go out of the house. I choose fruit juices over softdrinks and energy drinks.